“Elvis ate here. 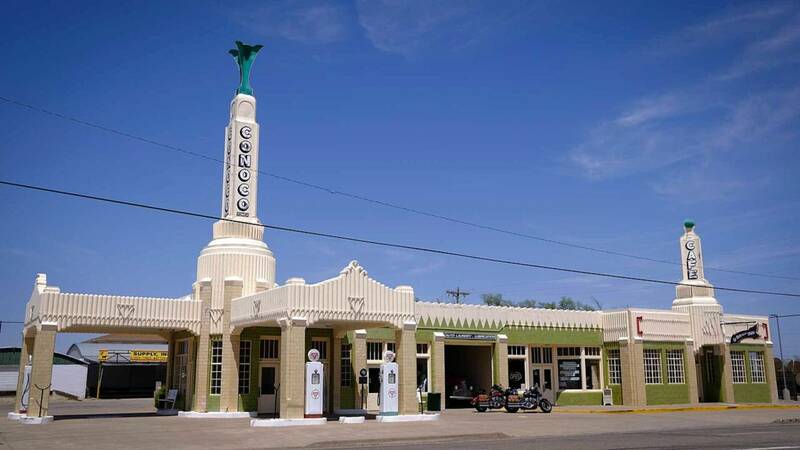 He sat right there, in that booth!” An excited remark from the shop attendant at a once roadside gas station and restaurant turned museum in Shamrock, Texas. Apparently, the U-Drop-Inn Café and adjoining fuel station are a rather well-known attraction along the lost two-lane highway that is Route 66. We spotted it on our Butler Map, listed alongside an assortment of other points of interest on the Mother Road. The Seaba Station Motorcycle Museum, Cadillac Ranch, and the Wigwam Motel were a few others we intended to visit during our two-week trek from Tulsa, Olahoma, to Phoenix, Arizona. 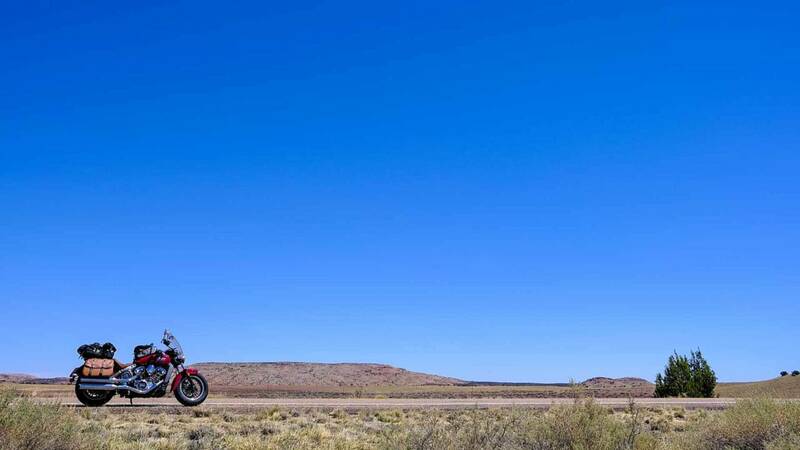 We were coming back from the East Coast, having just finished filming the third episode of our new moto-travel show, Perpetual Motion. In the weeks, er, months prior, we had made our way from Baja, California, to Texas, then through the South to Atlanta, GA, before finishing our trip on the beach in Daytona. At that point our videographer Nathan headed home, flying out of ATL where he ditched his 2018 Indian Chieftain loaner. 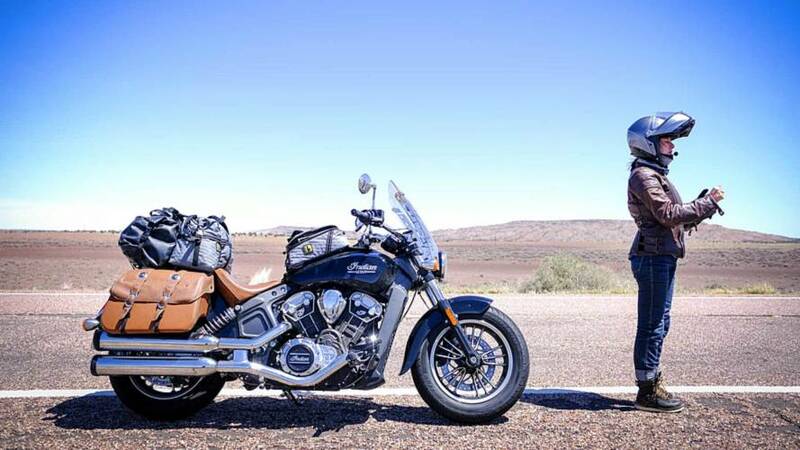 Kyra and I, however, had opted to ride our own Indian Scouts across the country and were now looking at a 2,000+ mile ride back to our desert domicile. No. Big. Deal. Instead of sticking to the southernmost route that Google had suggested, we decided to take advantage of this opportunity to see some parts of the country we’d overlooked in trips past. Namely, Route 66. So, after leaving Atlanta we made a pit stop in Little Rock, Arkansas, to see a friend and have our 20k mile services performed on our 2016 Indian Scouts, then pointed our wheels west-ish, and headed for Tulsa, Oklahoma, what would be the first stop on our nostalgic road trip. For those unfamiliar, Tulsa has the largest concentration of Art Deco architecture in the United States. A quaint agricultural community on the Arkansas River in 1905, Tulsa’s population went from some 1,400 souls to more than 140,000 between 1901 and 1930 after oil was discovered. Unlike other settlers in Oklahoma who most often moved from the South and neighboring Texas, this influx came predominantly from the commercial centers of the East Coast and lower Midwest. This boom was cause for a massive increase in commercial construction, much of which was completed at the height of the Art Deco period. Something both Kyra and myself are quite fond of. The fanciest Conoco station you'll ever see. I watched Cars for the first time the other night. It’s a great movie, and I’m not one to indulge in cartoon anything—so, there’s that. Also, about half of the architecture featured in the film’s protagonist town, Radiator Springs, I got to see with my own eyes along Route 66. The U-Drop-Inn, as an example. But that’s not what compelled us to ride along Route 66. It wasn’t the architecture or the carton movie cameos. We were both looking to see a part of this country that is now oft overlooked, the remnants of a once great road. The Mother Road. 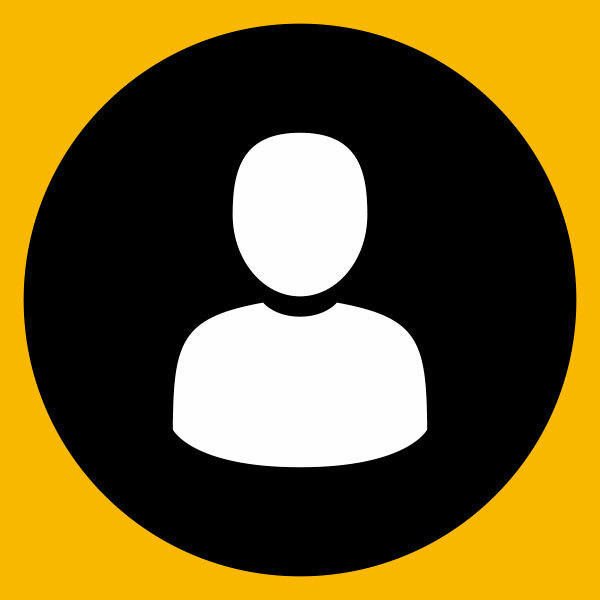 Which lead people across this great space at a time when commercial air travel was out of reach and automobiles and motorcycles were a more efficient and affordable means of transportation. We wanted to see what it was like, now, and try to imagine what it might have been like, then. Miles and miles of beautiful nothingness. A lot of America has nothing in it. Big swathes of wide-open grassland. Long, well-worn strips of cement reach across the country. You can stand in the middle of it and feel minuscule. Stop and not hear a sound. Across the great landscape they paved a road, a passageway connecting Los Angeles and Chicago. Towns and attractions sprang up along its shores trying to lure in patrons floating with the current. It was the only way across the country, and until the highway system was developed, this highway created an economy that catered to travelers and brought people through a part of the country they would have otherwise overlooked. Kyra and I left Tulsa early one morning. Our plan was to stop at the Seaba Station Motorcycle Museum, and then on to the Cadillac Ranch just outside of Amarillo, Texas, before finding some place to stay. The museum—which is owned by a group of friends and showcases their ever-growing collection of classic and contemporary motorcycles—is nestled inside an old gas station in Warwick, Olahoma. The station first opened in 1921, five years before Rout 66 was established, and has gone through many transformations over the years. 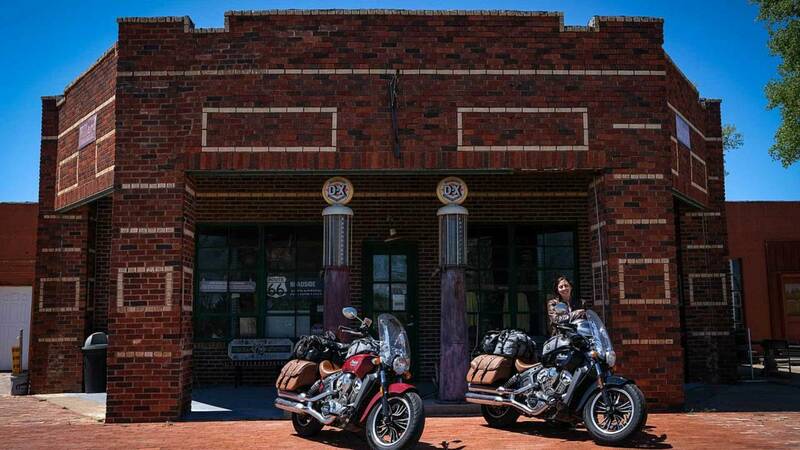 The museum itself opened in 2010 and serves as a must-see for motorcyclists cruising along Route 66. Adobe lasts pretty much forever. After the museum and a brief stop at Cadillac Ranch, we decided to take a detour. We headed north towards Taos, New Mexico, where we’d stay a few nights, sightsee, and then head south again to rejoin Route 66 in Albuquerque. That detour turned out to be a pretty alright idea. Taos is a small town in New Mexico’s high desert, surrounded by the Sangre de Cristo Mountains. 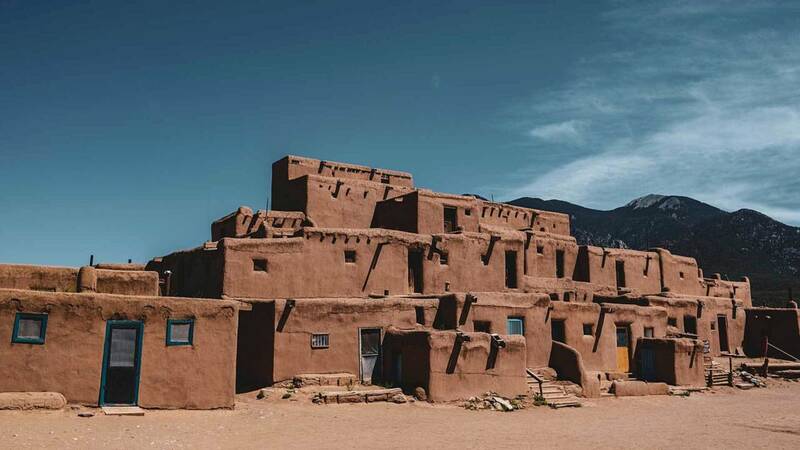 It’s known for its historic adobe buildings—the Taos Pueblo, a multistory adobe complex inhabited by Native Americans for more than 1,000 years. We indulged in the architecture, ate and drank, and just otherwise took it easy. We’d been on the road for months, and this was a well-deserved break. The roads that lead southwest out of Taos are spectacular. Through small towns like Pot Creek and Trampas, Rio Chiquito and then into Santa Fe. 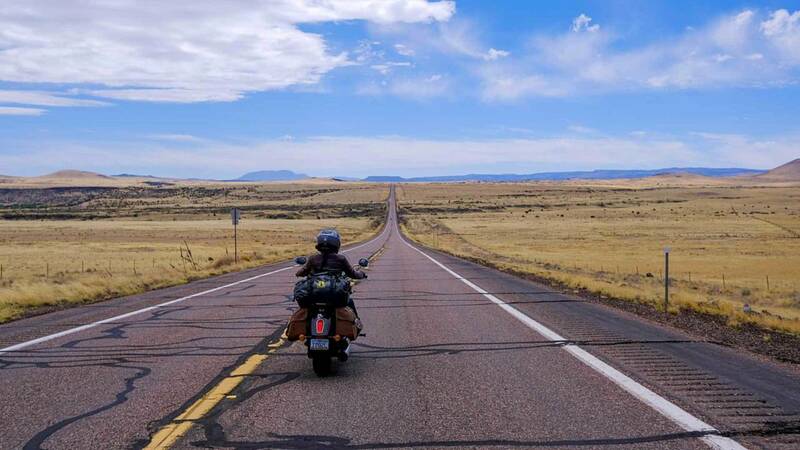 We stopped in Albuquerque as planned, then jumped onto Route 66 again, edging Highway 40 as we headed west. 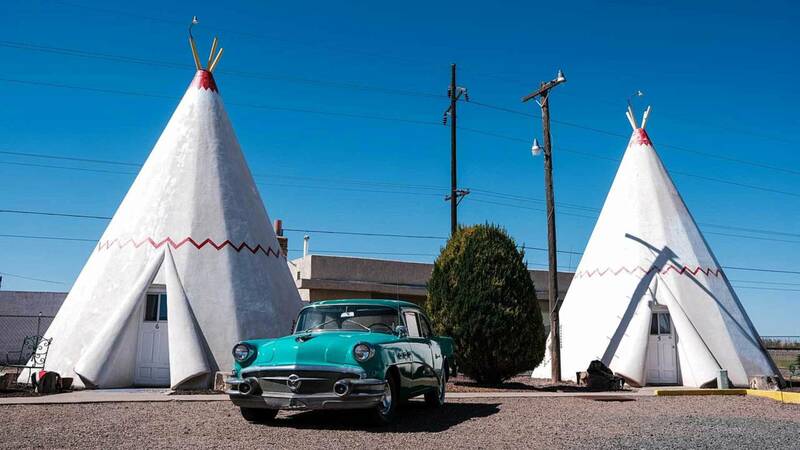 Our plan was to stay in Holbrook, Arizona, at the Wigwam Motel (also referenced in Cars, only they used orange road cones in place of tipis). This was looking to be a long day, as we’d be riding through Grants and Gallup, then south-ish through the Petrified Forest National Park (we didn’t stop, probably should have) and finally into the little town of Holbrook. This stretch of the Mother Road offered us a bit more of what we’d been looking for. Old neon signs hanging outside derelict hotels, rock shops and giant plaster dinosaurs, abandoned gas stations and trinket stores. Every town we passed through had a shop selling Native American art and accouterments. If you closed your eyes, you could imagine the route littered with '50s-era station wagons and post-war parents making their way east or west with cars full of children. It was what we had hoped to see. What we envisioned the Mother Road might be like, both now and then. The famous Wigwam Hotel. Not shown - actual wigwams. The Wigwam Motel was full up, unfortunately. So, instead of laying our heads in a huge hotel tipi, we stayed across the street at a quaint little joint run by a German family. Holbrook itself is the quintessential Route 66 town. An otherwise lifeless place established in the early 1880s when the railroad passed through, Holbrook became a bustling stop along the Mother Road—a place where Route 66 intersected with roads that would lead travelers north into the Navajo Nation or south into the mountains surrounding Show Low and Highway 60. Now though, like many of the towns along Route 66, Holbrook is slipping through the proverbial cracks of America’s highway history. Without an established economy or the support of weary travelers, the majority of the Mother Road that isn’t attached to Highway 40 is disappearing. Travelers like us often choose the 75 mile per hour speed limits the Interstate offers over the slow lanes of the past. That’s exactly why we should spend more time exploring this forgotten byway, though. So we slow down a bit. See the sights. Stay in a strange roadside motel. Maybe eat more ice cream. In a world moving faster than it can spin, it’s things like the Mother Road that make us take a step back, help us remember, or simply encourage us to sit back and enjoy the ride.